Welcome to Part 2 of Sequential Sunday’s look at the highly varied and completely mind-blowing work of 3-D processing master Ray Zone! In part 1 we saw numerous examples of depth-defying art from early issues of Zone’s self-published title The 3-D Zone. Though this series constitutes a sizable chunk of his 1980’s output, Zone applied his skills to the comics of numerous other publishers from the decade of the independent publishing boom as well, including Eclipse Comics. 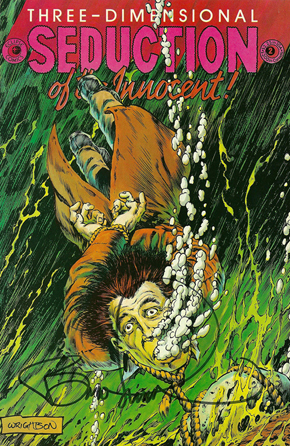 In addition to working with Eclipse characters such as Miracleman, DNAgents, and Mr. Monster, Zone also provided a myriad of multi-layered effects for two issues of Seduction of the Innocent. This title reproduced gruesome 1950’s horror comics, the kind which had started the parental and congressional outcry that led to the rise of the dreaded, creativity-stifling Comics Code. For Blackthorne Publishing, Zone worked on the first (and only) issues of the fantasy title 3-D Heroes, and the underground comics compilation Bizarre 3-D Zone. Bizarre 3-D Zone is a real treat for the underground comics fan boasting a roster of revolutionary luminaries like Spain, William Stout, and Robert Williams. Of all the independent publisher to close their doors in the late 80’s and 90’s, none are more missed and lamented than the great Kitchen Sink. Zone contributed work for the company via 3-D comics featuring classic comics characters Steve Canyon and Will Eisner’s The Spirit. Will Eisner’s gorgeous title pages for his Spirit tales are tailor made for the third dimension. One of the very best 3-D images amongst all of the books mentioned here is the following title image for The Spirit adventure The Vortex. Like many 3-D images the following takes a moment or two of viewing to fully sink in, but when it does it is truly astonishing. An interesting side note about all of the comics discussed is that virtually all contents are in 3-D including advertisements. This is really getting the most bang for your buck! Zone’s own title (The 3-D Zone) continued to be published throughout the 80’s & 90’s with a eclectic range of subjects including the all-time undisputed pin-up queen Betty Page. If the word mondo is defined as “extremely unconventional or bizarre,” then Mondo 3-D fits the bill perfectly. A collection of weird (and sometimes brutal) photographs mixed with underground comics and surreal art, Mondo 3-D is only for the bravest of viewers. The show-stopper in Mondo 3-D is the book’s closing story The Show of Violence by Daniel Clowes. Based on sections of the 1949 book of the same name by Fredric Wertham, (in his pre-comic book bashing days) each page is a full splash panel depicting and describing a true-life disturbed maniac and their brutal deeds. Comics publisher The Edge Group recruited Zone to supply the multi-layered processing for the premiere (only?) issue of Behold 3-D. What makes this comic somewhat unusual is that all of the sci-fi, fantasy, and supernatural sword & sorcery tales presented all carry Christian themes, some subtly stated, while others not so much. 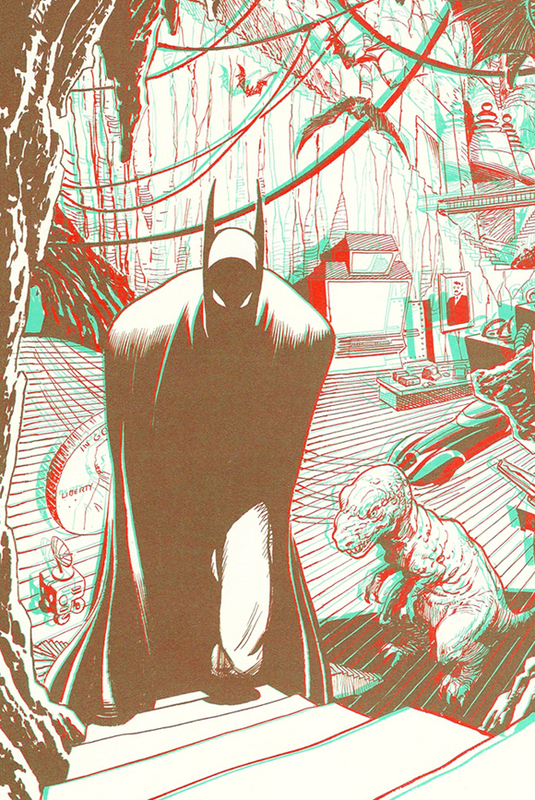 In 1990 Zone produced his first project for a mainstream comics publisher with the over-sized 82 page book Batman 3-D for DC Comics. Included in this volume is a full 47 page Batman adventure written and illustrated by John Byrne titled Ego Trip in which Batman face all of his major villains including Two-Face, The Penguin, The Riddler, and The Joker. Specifically created by Byrne to be processed in 3-D, there are tons of intense multi-layered images throughout the entire action-packed tale. Just as great is the pin-up section in the book where industry greats such as Klaus Janson, Mike Mignola, Dave Gibbons, Al Williamson, George Perez and many others give their take on the Dark Knight and his world. Rounding Batman 3-D is a reprint of the 40’s story Robot Robbers. There is no way to be certain who the art can be attributed to, but it is believed early Batman great Sheldon Moldoff and Curt Swan handled the drawing chores here. Throughout the 2000’s Zone has continued to contribute amazing work to a multitude of publishers including Wildstorm (Danger Girl), Raw Studios (Bad Planet), and IDW (Clive Barker’s Seduth.) For more on Seduth see the Sequential Sunday Horror Roundup article here. Over the years many comic scribes have written stories with the specific intent of having Zone give them his signature third dimension treatment and in 2008 he teamed with Alan Moore for the otherworldly climax of the graphic novel League of Extraordinary Gentlemen: Black Dossier. Black Dossier stands as the most surreal and idea-heavy entry yet in the Gentlemen series. To have Zone’s 3-D expertise heighten the already phantasmagoric final pages of the book is a brilliant choice to say the least. We’ve seen many outstanding 3-D images over the course of these two Sequential Sunday articles on the great Ray Zone. Still, what has been represented here is but a tiny sampling of the almost 30 years of work Zone has amassed to date (for an up to date checklist of his comic book accomplishments please see here.) Our continued fascination with the instantly euphoric visual gratification that is 3-D is certainly here to stay. Hollywood’s current infatuation with the art form will undoubtedly wane in time as the imposed upon us fad that it is. Yet the true masters of three dimensional imagery like Ray Zone, who view the process with the respect it deserves, know that the magic found within those comic panels and celluloid frames lives forever.